Kropotkin noted that practices of cooperation, including in-kind assistance, community resource pooling and sharing, and group financial support stretch back thousands of years. Today, these forms of mutual aid remain essential to millions of people and their ability to survive and thrive, especially for refugees due to the dire circumstances they face. Yet practices of mutual aid somehow are under-studied in academia, often overlooked by aid agencies, poorly understood by financial service providers, and largely unsupported by digital technology. At aidx we’ve been focused on the question of how to support, strengthen, and grow these networks. This has driven our use of human-centered design and ethnographic research in refugee communities, where mutual aid is nearly ubiquitous and is a vital system people use to deal with the realities of forced migration. In our efforts to better understand how these networks function, we decided to map one. We wanted to see if it would give us insights into reciprocity, size, and overlap with other types of relationships. We were also curious to see what else we might learn from it. Below is the resulting interactive graph of a real network of mutual aid made on the excellent site Graph Commons. You can hover over or click on nodes (people and groups) to see how they are connected, and filter by edges (financial relationship types) and/or nodes to see sub-networks. Network elicitation for this graph was performed via several hours of interviews with a person in Kenya. We have changed the names of the people to protect this person’s identity. As you can see by clicking on the info button, nodes and colors represent family (blue), friends (purple), and work colleagues (gray). The types of financial assistance are giving (gray), interest-free loans (pink), loans with interest (orange), table banking (green), pooling (purple), and table banking (green). Some of our analysis of this network graph is below. 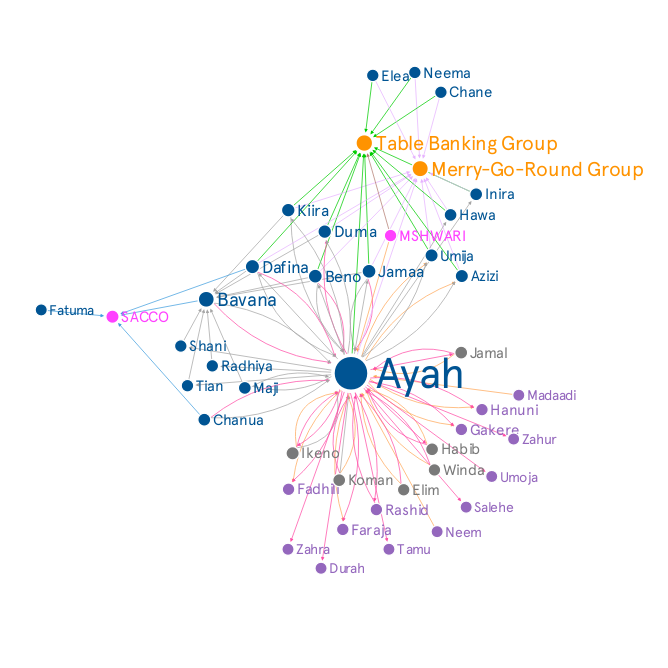 “Ayah” is the central node and has the highest degree centrality score (66) in this network graph. But that is a result of the method of network elicitation, which focused entirely on Ayah’s network of financial support. Ideally, we would have been able to conduct interviews or surveys with each person in this graph to map their own networks. This could have shown interesting degrees of network overlap as well as a more interesting centrality analysis, but that was not possible within the time available. One hypothesis we hoped to test was that peer-to-peer lending activity would be more widespread than giving. There are 17 people (nodes) with giving relationships, 15 in the loans-with-interest category, and 23 in the interest-free loan category. There is also the lending which happens in the table banking group, which consists of 13 people. Filtering for these three types of lending activity, there are 34 people in this network who borrow or lend, compared to 17 who give or receive gifts. People who borrow or lend are twice the number of people who give, but this is only one data point, so we can’t validate our hypothesis without further research. One interesting thing that is apparent with these filters is that there aren’t many people who are in both the giving network and the loans-with-interest network. In this graph, the overlap is between interest-free loans and giving. Who does this person give to and receive gifts from? We can filter the network map by “Gives To” and see the result. The answer is family (represented by blue nodes), with two work colleagues as well. We were surprised no friends were part of a giving relationship. Direct reciprocity (two people who both give financial gifts to, and receive them from, each other) exists with five out of 18 people, whereas the giving relationship is “one way” with the other 12 people. 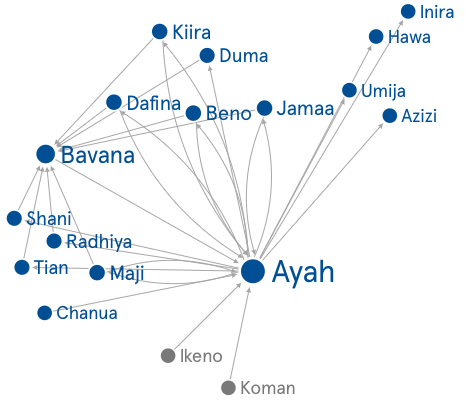 The mother, Bavana, has a prominent place in this network. Ayah stated that almost all of the brothers and sisters give to the mother. Zero-interest loan assistance makes up a very interesting part of this network because it spans different types of relationships. Family, friends, and work colleagues all participate in zero-interest loans to or from Ayah. There is direct reciprocity with only four of the 23 people. Ayah is on the receiving end of these types of loans from several family members and is a lender to every friend. Ayah said loans without interest were often social in nature — to help pay for travel costs to visit a sick family member or to cover a short-term gap in income to help pay rent. Sometimes a loan without interest is partially repaid and the balance simply becomes a gift. Loans with interest were described as typically being “for business” — to buy inventory for a store, to buy a plot of land, or to conduct other transactions that might generate income. In the peer-to-peer context, this type of assistance primarily occurred outside of the family group, with friends and work colleagues. But the table banking group is made up entirely of family members and was formed specifically for this type of peer-to-peer financial assistance. Each month the group gets together and can decide to loan money to a member who requests a loan. The group then decides the terms of the loan. A merry-go-round is a type of savings pool in which a group of people all agree to contribute $50 per month to a pot, for example, and each month one person gets the entire pot of money. It is an extremely common method of accessing larger pools of capital across Africa, and it goes by many names: chama in Kenya, tontine in Senegal, and ayuto in Somalia, just to cite a few. 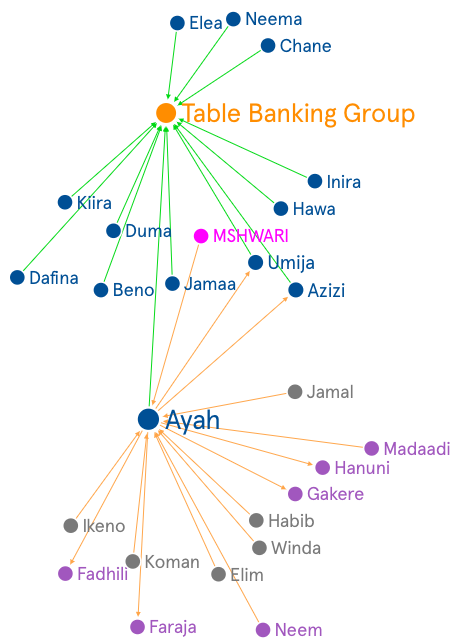 Ayah’s merry-go-round group also engages in table banking. For Ayah’s group, loan terms typically meant a 30 day repayment period at 10% interest. We expressed surprise at the high interest rate, and Ayah explained that one function of the interest rate was to gradually grow the available pool of money that could be lent so members could borrow increasingly large amounts and subsequently invest in business opportunities with higher potential for income. In Ayah’s case, these two types of financial assistance happen within the same group of people. We found it interesting that immediate family members were not part of a pooling group with the interview subject. 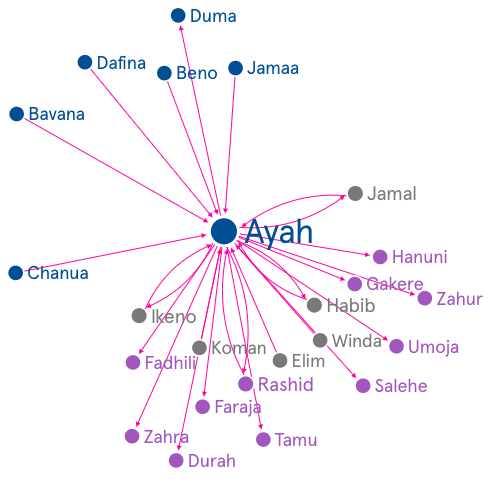 It may not be immediately obvious from the network map, but all the people in these groups are Ayah’s cousins. One thing we noticed is that the types of financial assistance with work colleagues are more diverse than the types of financial assistance with friends. In the above image, purple nodes are friends and gray nodes are work colleagues. This may be especially surprising for people in the US, where cultural norms strongly dissuade asking work colleagues for loans (with or without interest) or receiving gifts beyond “I’ll buy you lunch today” or “let me buy you a coffee.” In Ayah’s network, most assistance to and from friends takes the form of zero-interest loans. But arrangements with work colleagues also includes loans with interest and two giving relationships. It would be really interesting to conduct more network elicitation with other people to see if there is a similar pattern of more diverse financial assistance relationships with work colleagues. Creating a network map helped us gain some new insights into this network of mutual aid, which are detailed above. It also points to a great deal of future research that could inform how we think about these networks. One area of further exploration would be to map the frequency of assistance. How often are gifts and loans made? This could be mapped using the line weight dimension, which is currently the same between all nodes. Another topic for further research is the value of assistance within the network. Ayah gave us some general figures for some gift and loan amounts, but a systematic analysis would add richness to our understanding of the network. It might also be possible to strike a balance between frequency of assistance and amount of assistance by creating an “average assistance per month” calculation. In this scenario, a yearly gift of 1,200 KES would have the same line weight as a monthly gift of 100 KES. This would help highlight long-term flows of assistance. Each these three ideas would provide some insight into the strength of individual relationships (edges). In the graph above, we currently have to rely on diversity of types of mutual aid to guess at the strength of these relationships, which is a poor placeholder. Adding a line weight dimension would change the graph and help us see where bonds of mutual aid are strong and weak. Our previous research demonstrated that some people have very weak or small networks, so finding ways to strengthen or even build new relationships of financial cooperation for these people is important and would improve their financial resilience. Ultimately, it would be tremendously helpful to gather more data points, whether that is done by working with members of Ayah’s network or mapping unrelated networks and comparing them to this one. This could help us find high-impact areas for further research and development. Finally, it’s important to note a few of the interesting questions of representation in trying to create a network graph of the social relationships considered here. 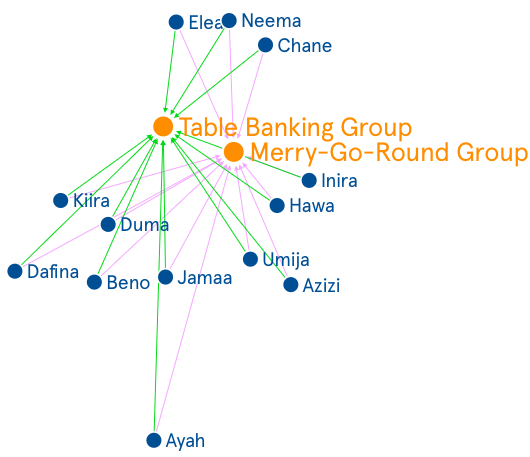 Creating the table banking and merry-go-round nodes, for example, resulted in a map with far fewer lines (edges) than if we had connected the 13 members of the group to every other member twice (once for each activity). It is tempting to look at a network graph and assume that line density correlates with strength of connection, but such analysis can be misleading and depends on editorial decisions about representation. Another editorial decision we made was to not use double-ended arrows when there was reciprocity in a financial assistance relationship (i.e. when I give to you and you also give to me). Instead, we created two separate lines because the double-ended arrows were difficult to see and thus not visually impactful enough to draw out reciprocity, which was one of the key areas we wanted to investigate with this analysis. It’s important to peer behind the process of making this graph to see that it’s certainly not a definitive representation of what happens in this network, but can be a useful reference point if the production process is kept in mind. This exercise was possible because of qualitative research we’ve been conducting for over a year now. 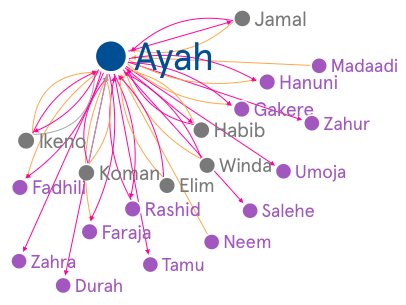 We collected the information in this graph through multiple interviews with “Ayah” over several months. More lightweight elicitation via an online survey is possible, but we don’t think the resulting data would be as robust or thorough as what we were able to gather. The time required to gather data like this may account for some of the missed opportunities in the aid and financial services sectors to strengthen these networks. But I’m excited that aidx is taking on this task, and there are several funders, researchers, and academics who are also working in this area. Hopefully this research points toward some interesting directions of future exploration for all of us.